“Waiting On Wednesday” is a weekly meme that was originally created by Breaking the Spine. Unfortunately Breaking the Spine are no longer hosting so I’m now linking my posts up to Wishful Endings Can’t Wait Wednesday. Don’t forget to stop over, link up and check out what books everyone else is waiting for. If you want to take part, basically, every Wednesday, we highlight a book that we’re really looking forward to. This week my book is : Empress of Forever by Max Gladstone: this sounds like a whole lot of fun. A feminist Guardians of the Galaxy—a smart, swashbuckling, wildly imaginative adventure of a rag-tag team of brilliant misfits, dangerous renegades, and enhanced outlaws in a war-torn future. A wildly successful innovator to rival Steve Jobs or Elon Musk, Vivian Liao is prone to radical thinking, quick decision-making, and reckless action. On the eve of her greatest achievement, she’s trying to outrun those who are trying to steal her success. In the chilly darkness of a Boston server farm, Viv sets her ultimate plan into motion. A terrifying instant later, Vivian Liao is catapulted through space and time to a far future where she confronts a destiny stranger and more deadly than she could ever imagine. The end of time is ruled by an ancient, powerful Empress who blesses or blasts entire planets with a single thought. Rebellion is literally impossible to consider–until Vivian arrives. Trapped between the Pride, a ravening horde of sentient machines, and a fanatical sect of warrior monks who call themselves the Mirrorfaith, Viv must rally a strange group of allies to confront the Empress and find a way back to the world and life she left behind. A magnificent work of vivid imagination and universe-spanning action, Empress of Forever is a feminist Guardians of the Galaxy crossed with Star Wars and spiced with the sensibility and spirit of Iain M. Banks and William Gibson. 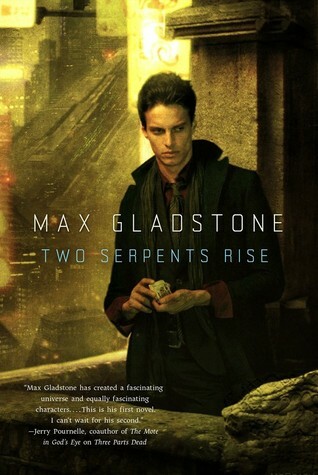 Today is the final week of our readalong of Max Gladstone’s Two Serpents rise. Lynn over at Little Lion Lynnet’s is our host this week. Without further ado lets get to the Q&A and if you haven’t read this book be aware that there will be spoilers below. 1. I think we all pegged Mal for being involved with whatever is going wrong in Dresediel Lex after the way Book 3 ended last week. How do you feel about discovering how deep that involvement goes? Sort of disappointed to be honest – which I think just goes to show that I was really hoping that she wouldn’t be quite so bad or that somehow she’d manage to find some sort of compromise and would be redeemed. I wound up feeling like she was just as big a fanatic as Temoc and would stop at nothing to get what she wanted. I mean, I always had trust issues with Mal but I really didn’t expect her to be quite so extreme. 2. Caleb and Temoc have to work together to save Dresediel Lex (and the world) from certain destruction. Do you think they make a good team? I quite enjoyed reading that element of the story and again was surprised that Temoc had such different intentions. Clearly he’d pulled the wool over my eyes as well as Caleb’s. I think Teo’s remarks about him not being a team player when they were running up the stairs was a good hint in that direction and also her distrust of him should have given me more of a clue but I just failed to pick it up and was really hoping that he was going to go all out to try and make Caleb’s suggestion work. He didn’t really end up making any friends in the end. Strangely, Mal and Temoc turned out to be very similar in the way they were prepared to go to such extreme lengths. 3. What do you think of the narrative’s overall treatment of Teo? Especially in light of her role in the finale? I think Teo has been an interesting character to read and I was a bit surprised to be honest at her becoming such a victim all of a sudden. Again I didn’t see that coming at all – but, she managed to turn the situation around and with Caleb working with her summon up the Red King. I was pleased with the eventual outcome for both Caleb and Teo. 4. In the epilogue Caleb seems to have found a way to compromise between the ways of his father and the new world brought about by the God Wars. Do you think he’ll succeed in his goals? It does seem like something of a dangerous idea but I really think he could make it work, The Red King seems inclined to help and Teo and Caleb make a good partnership. You have to hand it to Max Gladstone for coming up with such an unusual world filled with strange creatures, magic and Gods and for managing to make his stories into something much more than you would generally expect. I’ve really enjoyed all the discussion that this book has inspired and so thanks to all the other bloggers for making this so interesting. Today is our third week of the readalong of Max Gladstone’s Two Serpents Rise this week hosted by the lovely Lauren at Violin in a Void – so be sure and stop over there too. This week the action has certainly increased and I’m keen to get to the discussion so will jump in without further ado. If you haven’t read this series please beware of spoilers below and if you have read it then please join the discussion! 1. After the fight at Seven Leaf, Caleb apologises to Mal and they finally start dating. What do you think of the way their relationship has developed? Do you agree with Mal that Caleb chased her because he needs gods in his life? It’s a strange relationship and I haven’t entirely trusted Mal for a while now. The last few chapters have done nothing to change my feelings in that respect although oddly I don’t find myself disliking her. Conversely, I didn’t think Caleb had anything to apologise for but it seemed that he wanted the relationship to continue more than Mal did and so did the chasing and apologising – it’s becoming something of a pattern really in terms of Caleb wanting this relationship the most. Mal is a conundrum – I don’t really know what her feelings are about Caleb but I think their whole relationship is based on misunderstanding. I don’t think they really know each other at all and what they have together is very tenuous to say the least and based on what they both want to believe rather than what is actually the truth. It’s going to be interesting to see if they have something stronger or not. 2. This section has been quite philosophical. Where do you stand on the debate – gods, no gods, or some kind of compromise? Do you agree with Caleb’s idea of sacrificing your morality because the religious alternative is even worse? It’s an intriguing debate and I’m not totally sure what the right way forward is really. It seems to me that both ways are flawed at the moment – either an all powerful and greedy God or a substitute system that still requires very dubious moral choices. It would be better if a compromise could be reached but I’m not really sure that’s possible. It’s difficult to comment really because in our world people either believe in Gods or not – in Gladstone’s worlds it’s a different thing altogether because clearly there is very real evidence that they do exist – it’s more about what you’re prepared to put up with to live the life you want. 3. Gladstone is still unveiling amazing things in his world, like a sport based on myth, the eclipse festival, walking on water, and a half-dead sea god whose heart is being used for desalination. What interested you the most? The walking on water idea brought me to a standstill to be honest – I had to stop and go back a little bit, like, ‘did I really just read that’. Such an unusual idea that put me in mind of the story of Jesus walking on water! And the whole idea of using a half dead God to clean up sea water for drinking purposes – it’s a bit horrible really isn’t it? Like you’ll just take the bits and pieces of whatever happens to suit your needs the most. So, you’re not having a God based system because the costs are still too high for you but you’ll just keep certain parts – I’m not entirely happy with that idea – ties in with question 2 of course. In terms of jaw dropping – what about the thing with the shark – OMG – not sure I’d want a shark to try and eat me during, ahem, you know! Talk about coitus interruptus. 4. Mal has noted twice that they don’t have much time, and she apologises to Caleb while he sleeps on the ocean. Then Alaxic kills himself and tries to kill Temoc – the last two priests of the old Quechal. What do you think is going on here? Any speculation about how it might turn out? Well, it just makes me think that Mal and Alaxic are working together – which okay I’m just being daft as clearly she was revealed as working with Alaxic at the contract signing – I think that was the first major indication for me that Mal wasn’t all she seemed though. I don’t understand though why Alaxic would try to kill them both. Maybe he thinks that Temoc will be able to thwart whatever plans are afoot. I can’t wait to see how this ends and looking forward to all the discussion this week. Today is the second instalment of our Two Serpents Rising readalong. The full details can be found here. If you want to take part then there’s still time. Just leave a comment. This week is being hosted by the lovely Lisa from Over the Effing Rainbow. The Q&A are below and please beware of spoilers. 1) So we’re halfway in, and we seem to have uncovered the culprit already… What did you make of the confrontation at Seven Leaf? I sort of have mixed feelings here and I’m not sure why but I’ve left it for a while in order to reflect and all I can come up with is that I was a bit underwhelmed with the confrontation. I don’t really know why. It wasn’t the writing but I felt like it was a very quick confrontation and for some reason it didn’t create any tension for me personally and it didn’t feel like there was ever a real threat involved. The only thing I can come up with is that the whole thing was a set up for something else which maybe hasn’t occurred yet or maybe it was a way of raising a number of different issues about Mal and Caleb – such as the fact that Caleb isn’t totally defenceless or the whole issue with Mal and her ideas around atonement. I certainly didn’t see that coming. It was good that they both worked together though and let’s face it Mal couldn’t have succeeded without Caleb’s help. 2) Temoc is still turning up at random, and still protesting his innocence. Doth he protest too much…? I think you could be forgiven for thinking he protests too much but somehow I believe him. And now I’ve said that I’ve no doubt I’ll be immediately proven wrong but I don’t dislike him somehow. He’s clearly not perfect but he doesn’t give me the creeps. 3) The Red King. Discuss. This guy could easily give you the creeps but again, at the moment, I’m a little on the fence with him. There’s something about him that I can’t quite put my finger on yet. I’m puzzled about him sending Caleb on the mission to Seven Leaf with Mal. Does he mistrust both of them? I wonder if he knows more about Caleb’s original withholding of information about Mal or maybe he just suspects something because they’ve come out about being in a relationship. It does feel like he’s testing Caleb. 4) And let’s not forget Mal! I confess, I did not see any of those surprises coming. What do you think of Caleb’s ‘sweetheart’ now? She certainly has a lot of tricks up her sleeve. I’m really enjoying the way theyre both ‘pinging’ off each other and even though this ‘romantic’ element isn’t the main focus for the story I’m really enjoying the way it’s being included. There is definitely a lot of electricity between the two – and a lot of secrets. Mal’s part in brokering the deal and testing out the security at the water plant – not sure what to make of that yet. Can we trust her? I think that’s the main question really. She originally made out that she was simply out to get a bit of a rush with her extreme sporting – but that wasn’t really true. Then again, she wasn’t involved with Caleb at the time – I wonder whether her feelings for him are going to interfere with things for her one way or another. It’s going to be interesting to see how this plays out. Part of me really wants everything to go okay and part of me wonders whether Mal has a different agenda of her own. You have to love the creativity of Max Gladstone. He comes up with such a lot of unusual concepts. I love the ways of getting about in this one – particularly the flying. And, more particularly, the huge dragonfly like creatures that clasp onto your back and carry you – whilst sucking out a little of your soul. Yeah, you’d want to be careful about just how long your journey was! Hi everyone, sorry I’m late with this one but life just conspires sometimes! So, the first week of the Two Serpents Rising readalong is upon us. Susan from Dab of Darkness is our lovely host (over here) and the details for the readalong are here. You know you want to join us! 1) Poison in the Bright Mirror reservoir! What are your thoughts on the infestation? Then an explosion later on! Any ideas of who is the culprit yet? Are the two events related? That was a bit mind blowing wasn’t it – I certainly didn’t see that coming at all – makes me have second thoughts about walking round reservoirs. I can’t help thinking the reservoir and the explosion are linked – it’s just too much of a coincidence and it will be interesting to see if Mal is being used or is involved. I hope that she’s not involved as it would be a bit obvious. 2) Let’s talk about Mal and the sport of cliff running. Care to compare this sport to one here in our real world? What do you think Mal gets out of the sport? I suppose she gets to be rebellious to a certain extent – she seems to come from a privileged home so it seems that this is her little break out. Also, I suppose she gets a massive rush of adrenalin and a certain number of cool points as she does seem to be rather a daredevil. I’m not sure what sport it reminds me of – other than perhaps something I saw about people jumping roofs – but I could have just made that up or dreamt it or something. 3) Are you enjoying the deities and culture this book is infused with? Has any of the architecture wowed or frightened you? The first book was impressively creative so there was a lot to live up to and I think so far this one is definitely doing well to live up to it. And, in spite of the clue in the title – snakes, really!! Yes, between the serpents and reservoir monster – omg! Both scary – and what was the whole thing with the slaughterhouse. Talk about watch this space. 4) The Red King is a pretty serious guy. Will he make the deal with Alaxic concerning the powerhouses known as Achel & Aquel? I think it’s too soon for me to call at the moment. There is definitely something big afoot but I’m really clueless to be honest. The Red King though – what a description heh! Wouldn’t really like to meet him alone in a dark alley – he just sounds creepy. 5) Finally, Caleb has a wealth of scars, linguistic skills, and a complex relationship with his father. Discuss! This is very intriguing to me. I wouldn’t say that Caleb seems unduly jumpy or scared when his dad is around so I’m kind of discounting certain things, I suppose. And he doesn’t seem to hate his dad – they just clearly don’t agree with each other – which no surprise there given what his dad is up to – and certainly his dad’s got a terrible reputation which does rather get in the way of Caleb’s work. It’s complicated to say the least. A great start to the series – I feel like I’ve been very bad this week though – I’ve not really given this a detailed examination so looking forward to everyone elses’ comments. Sorry for being absent. Loving the book so far though.